Jarlsberg: Norway’s Most Famous "Baby Swiss"
Yes, we bring you a Swiss cheese from Norway known as "Baby Swiss," but this cheese is no youngster. Jarlsberg was first made from 1815 to 1832 at the Jarlsberg Manor near the famous Oslo Fjord. For those not familiar with the term, a “fjord,” is a long narrow inlet into which the sea flows between steep cliffs. Carved by glacial activity, Norway is more famous for them than any country in the world. The country is also famed for its Jarlsberg cheese. The most widely hailed and popular of the Norwegian cheese brands, Jarlsberg accounts for sixty percent of Norwegian cheese exports. 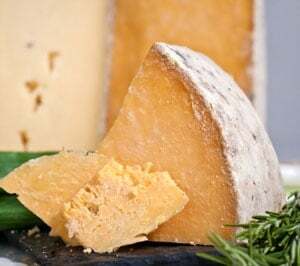 As is the case with artisan cheeses, Jarlsberg owes its high quality and smooth flavor to the richness and consistency of the milk provided by Norway's dairy herds. World famous, Norway's mellow, golden yellow Jarlsberg cheese has earned its fame from its characteristic nutty taste and attractive appearance with variously-sized round holes. A very versatile favorite of ours, it makes a fantastic table cheese that also works well in a variety of sandwiches and cooked dishes. Jarlsberg has the consistency, texture, and hole-formation of Swiss Emmental, but a sweeter flavor that is more nut-like than its Swiss-made counterpart. Another difference worth noting is the density and weight distinctions between the two. A full wheel of Jarlsberg weighs about 20 lbs., one tenth the weight of a wheel of Emmental, which may explain why it can aptly be called “Baby Swiss.” Despite these differences, Jarlsberg still makes a most suitable substitute for Emmental, be it as a table cheese, dessert cheese, sandwich cheese or recipe substitution. 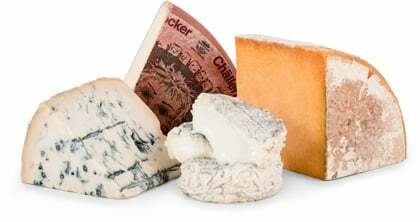 A mild cheese, reminiscent of Swiss, Jarlsberg has large irregular holes and a distinct nutty flavor. Its semi-firm yellow interior has a texture that is buttery rich with a mild and slightly sweet flavor. It's an all-purpose cow's milk cheese that's ideal for snacking, sandwiches, entertaining and cooking. It's often served with fresh fruit and bread. It melts beautifully, making it great for fondue.